Slice frankfurters lengthwise, but do not cut all the way through. Broil, about 3 inches from source of heat, 6 minutes, or until cooked throughout. Combine remaining ingredients in a saucepan. Cook over low heat, stirring frequently for 10 minutes. Add frankfurters. Cook an additional 3 minutes. Divide evenly. Makes 2 dinner servings. Note: Frankfurters are pre-cooked. Do not allow 2 ounces for shrinkage. *For dramatic service, cut pineapple so core remains in one piece, as shown. Stick frankfurters into pineapple core with hors d’oeuvre pics. 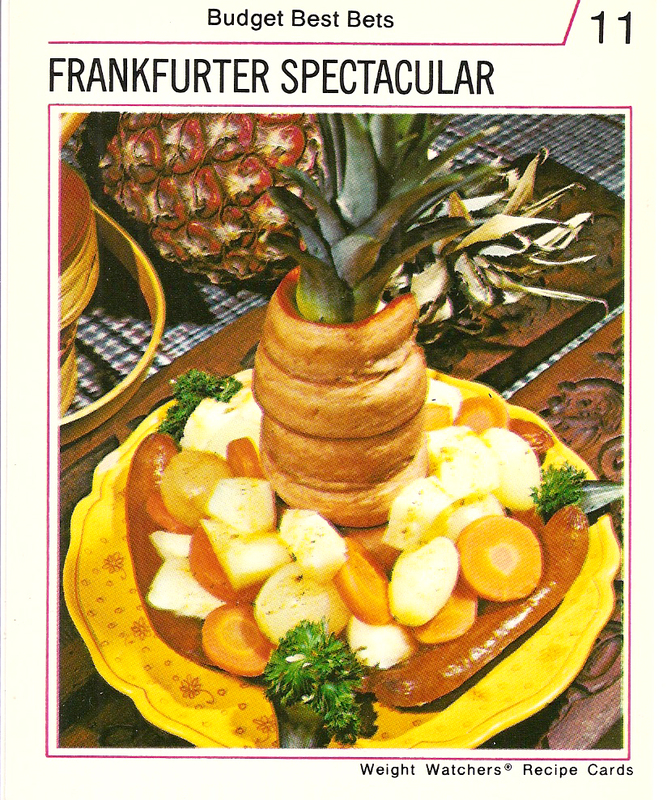 Place core with frankfurters in center of serving dish. Top with pineapple leaves. Add cooked mixture around base of core. Copyright ©Weight Watchers International, Inc. All rights reserved. Printed in U.S.A.